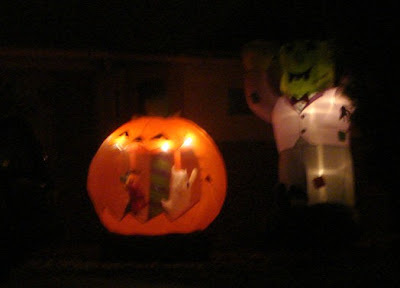 Weekend Assignment #240: Ooh, Scary! 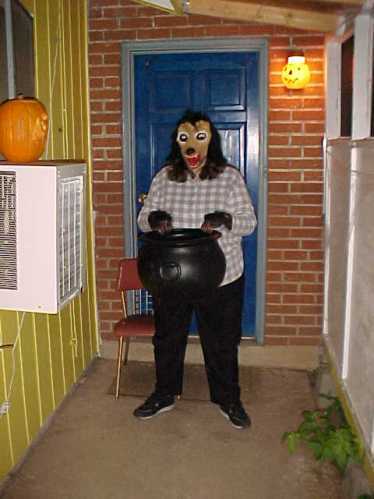 Weekend Assignment #240: Halloween is largely about fear, defanged and turned into fun. Have you ever been genuinely scared in a spooky or fun-scary situation? Extra Credit: Do you still dress up for Halloween? When I was about three years old, I had a recurring dream about a skeleton-monster invading my darkened bedroom. Other than that, the only fear I recall in this category has to do with three rides - roller coasters and such. In 1976 my mom and I visited Walt Disney World for the first time. It was fairly new then; Epcot didn't even exist yet, and there was still such a thing as an E ticket. When we got to Space Mountain, we read the warning (don't ride if you have back problems, heart problems, etc.) and opted to view a walk-through exhibit inside the mountain and skip the ride itself. Years later, possibly as late as 1986, John and I went on the ride together. The cars were toboggan-style back then, and I was squished into it on top of John. Worse, I wasn't really quite in the car, and not well strapped in with the old-fashioned airplane-style seat belt. To be plunged into a fast, jostly ride in pitch darkness when you're sure you're not properly secured is a genuinely scary thing. 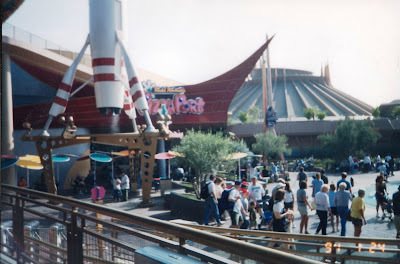 I didn't try to ride Space Mountain again at either park for a good five years after that. 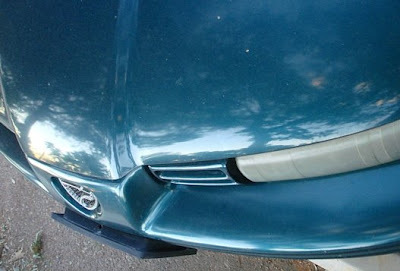 When I did, it was in a better designed car, and I had a blast. It's one of my favorite Disneyland attractions now. Now, that's a scary place! The other scary attractions that I've made myself go on are Splash Mountain (which still scares me, every time), the Maliboomer at Californai Adventure (which becomes more exhilerating and less scary with repetition), and the Twilight Zone Tower of Terror. That last one really is too much for me. The building facade is great, the pre-ride is wonderful, and the actual elevator drop part is truly terrifying, even though in principle it's very similar to the Maliboomer. 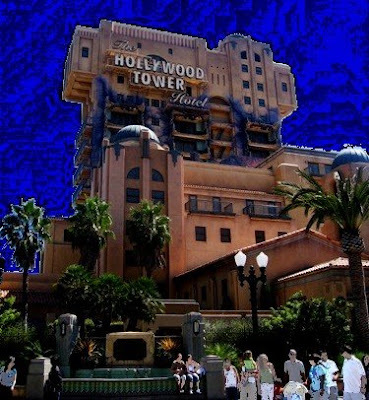 I'm not at all sure I'll ever be able to make myself give the Tower of Terror a second try. Oh, and the extra credit? What do you think? No one can place limits on your right to BE WHO YOU ARE. However, your right to EXPRESS that can indeed be limited - and when it starts to infringe on anyone else's right to do the same, it SHOULD be limited. To put it another way, no one can tell you what to feel or how to think, but they certainly can you tell how to BEHAVE, since unless you spend your life as a hermit, your behavior will impact everyone you come across. I certainly hope that people chose who to vote for based on issues and not the email/tv garbage that goes on. I find it offensive that anyone would think if you don't vote for Obamba it was for the reasons you mentioned. I've run out of time to write my post. I was going to say: Can we stop with the guns? It seems every argument leads to someone getting shot lately. Is it really worth shooting someone because they bumped into you? That really happened in Chicago a short time ago. Actually, the guy missed his target and killed an innocent girl. It's out of hand and stupid. That's all for now. 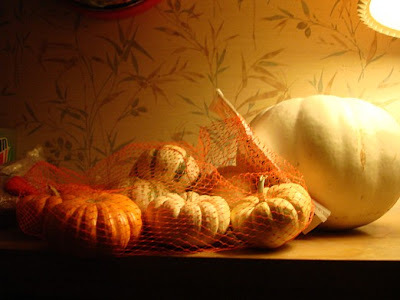 I'm getting mad all over again..
That's it for now, and it's Halloween morning. As you set up your fun chills and thrills for tonight, think of a time when you were small enough to take ghosts and monsters seriously, or you dared yourself to do something mildly dangerous, or some other fun scare was a little bit of a real scare. Write about it in your blog or journal, and include a link back here. Then leave a link to your entry in the comments below. I'll be back in a week to highlight the frights! Or, to be more accurate, can I? Last Sunday, a friend of mine asked what books I'm reading at the moment, and how work is coming along on my novels. I'm afraid my first, unvoiced reaction was, "What planet are you living on?" As tight as money is around here, I have a growing list of books on my Wish List that I would normally have bought and read by now - but that's not the main reason why I reacted as I did. No, it's more a matter of having no room in my brain or schedule for such things at the moment. In the immortal words of David Byrne, I ain't got time for that now. You know why, don't you? You've seen how obsessed I've been lately with... well, you know. It's the engine that drives me to spend many hours a day just catching up with my Twitter feed, lest I miss some nuance in the day's news. It's sent me back to the tv set for something other than DVD watching, for the first time in months. And it's the focus of my creativity, with all those buttons and blog articles, in more places than just here. But as many people are discovering (and griping about at some length, online and on tv), the stress of the countdown to next Tuesday can really get to you after a while. So here's my attempt to talk about something else. Anything else. Well, um, how 'bout those Phillies?" Nah, it's a non-starter. Who am I kidding? The last time I watched the Phillies in a World Series game, John Kruk was still in the lineup. I even haven't watched a major league game in a few years now, aside from glancing at a tv across the room at Chuey's. That was for a few minutes of a Diamondbacks game. Amazingly after all these years, Randy Johnson was pitching. Anyway, the most interesting part of this year's World Series for me was the punditry and sniping over the start time of Game Five and accusations of opportunistic expressions of support for two or more teams by two of the... no. I'm not supposed to be writing about that. 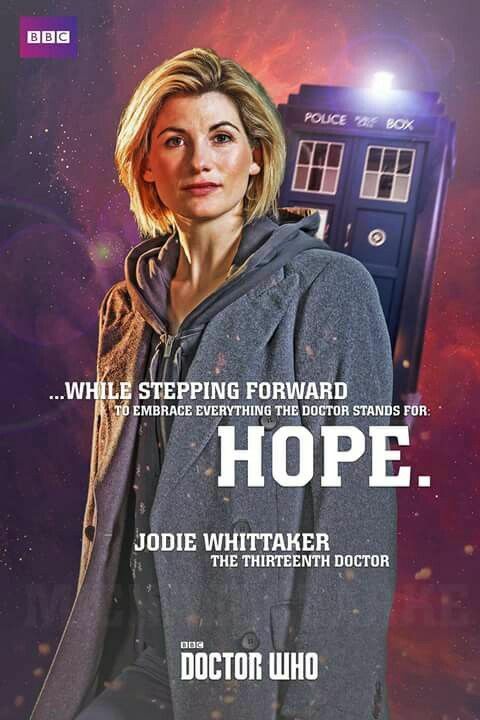 Doctor Who is always good for a few words, probably too many from the point of view of long-suffering non-fans of the show who read this blog. Now, I was going to write here that we're in the drought between the end of Series Four and the Christmas special, and so nothing much is happening except for the release of the DVD box set next month, which I stubbornly just ordered using unemployment money. But I just checked the Doctor Who web site just an case, and discovered that there's been momentous and rather upsetting news over the last day or two. David Tennant, the best actor ever to play the Doctor, is leaving at the end of the four 2009 specials. I'm really quite depressed about this. I always knew there was a good chance he'd leave before Hugo-winning Steven Moffat takes over the show for 2010, but I was hoping to be wrong. 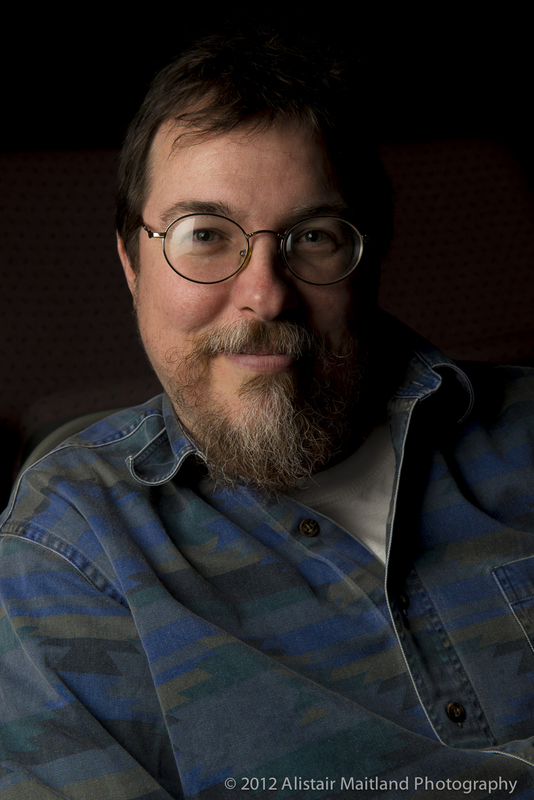 Still, the show will survive, and he's not gone quite yet. But I was going to say, apropos of the ongoing conceit of this entry, that when I have managed to teat myself away from That Other Subject, I've been watching Doctor Who. I even designed two buttons, one with the Tenth Doctor and one with his fob watch, in support of... but if I tell you about that, we're back to my self-imposed forbidden subject. So what do you think of the revamped design of this blog? I was kind of forced into it. I noticed the other night that the header still claimed this was the new home of the Monday Photo Shoot. In fact, Carly took this over a while ago, as the Ellipsis Monday Photo Shoot. But when I deleted the outdated text and made one other small change, the blog mysteriously insisted on pushing the sidebar to the bottom of the page. Undoing the small change didn't fix it. I hadn't intended to do anything much, and had not saved the template before tampering with it. Even changing templates entirely (in preview mode) didn't solve the problem. But when I removed the Mâvarin flag from the header, the sidebar snapped back into place. At that point, the wood grain image in the header didn't really look good any more. In fussing with that, I again failed to save the original template properly. I relied on leaving the original open in one tab, but that got refreshed at some point into a newer version. In the end I just went with the "Stretch Denim" template without a backup, and added a new, adobe-based header background that I made from a photo from a wall of St. Michael's. I like the result, but clearly, I absolutely went about it the wrong way. Kids, don't try this at home! Other recent changes have mostly involved adding widgets / gadgets to the sidebar and rearranging them from time to time. Blogs of Mavarin gives snippets of recent entries on my other blogs, most of them not very recent at all. 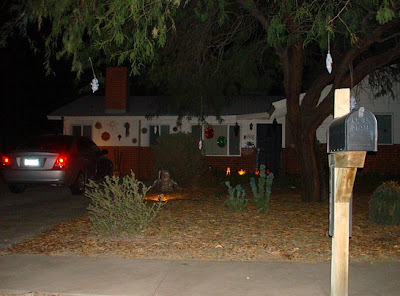 The exception is my blog Outpost Tucson, for which I wrote a "Closing Argument" entry on Wednesday night. I'm not linking to it here because it's on That Other Subject, but you can find it on my sidebar. Anyway, I'm hoping to set up more interactive blogrolly goodness after, you know, Tuesday. Meanwhile, I've had no more job interviews since that one job I didn't get, and no really good prospects. It's been a month and a half. I haven't been unemployed for so long since 1979. And yet the days are just packed. Oh, and the dogs are fine. Thanks for asking. They've had no more problems at the dog park, and are getting along much better with each other and with us. They've even made some new human friends over at...well, you know, the play I've been making those buttons. Oh, I agree. I'm sure there are people who are voting for McCain because they agree with his foreign policy, and maybe even on the economy. 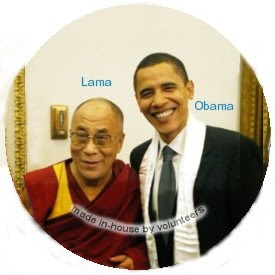 Unfortunately, I get smear emails every day from a friend who uncritically forwards every anti-Obama email, however irrational or disingenuous, including one that makes false claims about the Bible to convince people Obama is the Anti-Christ. I see footage of Palin supporters calling Obama all those names I mentioned, and heard robocalls making all sorts of horrific claims. Fortunately, like you, I believe that most Republicans reject the hysterical and false claims. But the people who believe this garbage are out there, and I worry about what they might do, aside from carving a B in their own faces. Well, it's true. I do worry about the people who believe the garbage. I worry that the two young neo-Nazis who were recently arrested for an ill-conceived plot to kill Obama and 102 other people aren't the only members of the lunatic fringe who will be gunning for the new President and his supporters if Obama is elected. But enough about them. Fueled by all the news items and those emails F. -- a perfectly nice former co-worker of mine, who supports cancer awareness and humane treatment of animals -- continues to send me, I tend to focus too much on the low information voters and bigots. What about everyone else? What about the positive, rational reasons for voting for McCain or Obama? I don't know for sure, and to be honest it doesn't make a lot of sense to me. But I imagine it's perfectly possible to vote for John McCain for reasons that aren't based on lies or innuendo. You may believe that the war in Iraq is being won, and will be won if John McCain is allowed to manage it. You may believe that he has a plan for capturing or killing Osama bin Laden, which he's not disclosing for security reasons. You may feel that McCain's approach to foreign policy is better than Barack Obama's, by dint of greater experience and toughness. You may believe that we need a saber rattler in the White House, not someone who prefers diplomacy and direct talks, who, to paraphrase McCain's hero Teddy Roosevelt, speaks softly and carries a big stick. Maybe you don't believe that Obama even carries a stick. Similarly, you may know perfectly well what the factual differences are between John McCain's economic policies and Barack Obama's, and still prefer McCain's. Despite evidence to the contrary, you may believe that the economy needs to be rescued from the top down rather than from the bottom up, with people who earn over $250,000 a year getting the bulk of the tax breaks rather than being made to pay what they were paying the day George W. Bush took office. But here is what I believe, based on extensive reading, and listening to quite a few talking heads from both sides of the aisle. John McCain has wrong-headed ideas on both foreign policy and the economy that are extremely similar to the ones that got us into the predicament we're in now. He has not offered one new idea with a reasonable chance of doing any good, and several that are likely to cause further harm. He has chosen a running mate who believes that dinosaurs walked the earth at the same time as man, who condones witch-hunting, who uses Alaska resources for her personal ends, who lies to the public frequently and without shame, whose husband belonged to a secessionist party for years, and who apparently cannot string two coherent sentences together without a TelePrompter. If that's not sufficient evidence of McCain's poor judgment in selecting her, add in his frequent lies about his opponent's policies, personal attacks based on tenuous relationships, baseless innuendo about socialism and other-ness, and massive hypocrisy in constantly accusing Obama and company of doing the same things he and his campaign do to a far greater degree. This is a man I've voted for for Senator, because I used to believe that even if his ideas were mostly wrong, at least he was a man of integrity. I was mistaken. Barack Obama, on the other hand, has a keen intelligence, an outstanding education, a steady temperament, a willingness to listen to Republicans and well as Democrats, compassion, fair-mindedness, charisma, eloquence and, most of all, policies and plans that will help the country and the world. With all due respect to Hillary Clinton, there is only one candidate this year, of any race or gender, with such a potent combination of assets. And a week from now, barring a major disaster or even more massive election-tampering than we've seen so far, he'll be the President-Elect. But if you want to vote for John McCain for rational reasons, based on his policies, his history and his character, you go ahead and do that. That's how democracy is supposed to work. 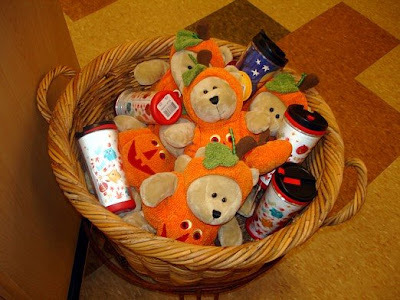 For EMPS #9: Happy Halloween! Carly wants to see photos of all things Halloween. There's just one problem at my end. Having been unemployed for about seven weeks now, I can't spend money the way I usually do on Halloween. That means no new decorations, no new costume. As busy as I've been with dogs and a job interview and obsessing about the election, I haven't decorated yet at all. When I do, there probably won't be a major themed effort, for the first time in years and years. 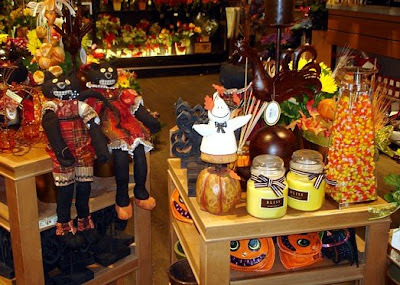 So let's look instead at Halloween decorations that I don't personally own. An over-brightened close-up for details. 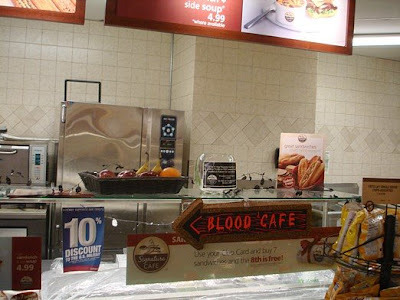 Don't want a side of soup? How about blood instead? Are those folksy dolls on the left supposed to be cats? 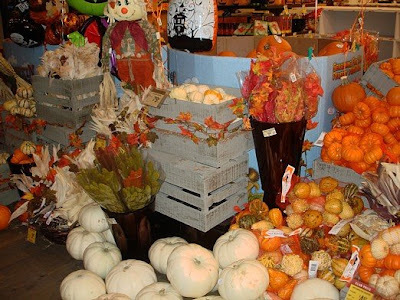 A Safeway fall harvest, with white pumpkins and scarecrow. 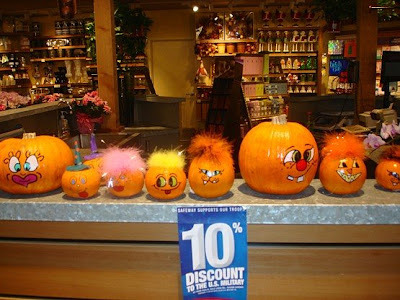 Ooh, scary pumpkins. The scare is the expense. That's it for now. Be sure to check Ellipsis every Monday for the Ellipsis Monday Photo Shoot, and for a roundup of the previous week's entries. I'm behind in checking out everyone's entries myself, but I promise to catch up this week. Yes, But Does It Help? Yet another new button design. 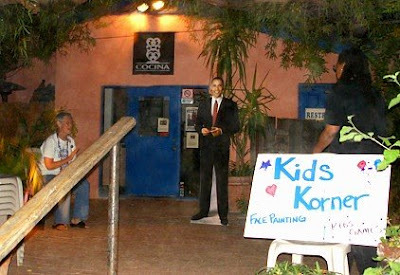 So tonight, in my quest to do something Obama-related and record the experience for Huffington Post, I went to a free concert at Old Town Artisans in downtown Tucson. Three hours later, I left early, having spent $1 on a raffle ticket and another $9 on burritos and Diet Pepsi. 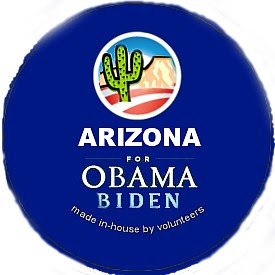 I came away with an official union-made Obama-Biden button for John, two free DVDs about Obama from the Arizona Information Project, and a nagging doubt as to whether I've done anything this weekend that helps my chosen candidate even a tiny bit. 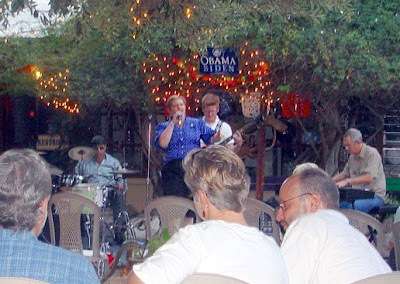 Amelia Dahl Quartet plays for Obama. Hip Hop artist James Ciphurphace followed with two spoken word pieces, as his young son shyly shared the stage with him. Then came Cinder Bridge, a keyboard and drums duo that was probably my favorite act of the night. Jacob "Roll" Acosta (say it out loud) sang and played acoustic guitar. Ticket to Tokyo was a full-fledged, Petty-inspired rock band. I didn't hear American Android, another rock group, as I was long gone by then. I gather that most of these musicians have appeared at several concerts for Obama over the course of the summer and fall. Aside from the opening act, which played standards, nearly all the music was original. Why, it's Barack Obama! At the concert! Overdressed! It was a beautiful night, with perfect weather, a pleasant setting and genial company. 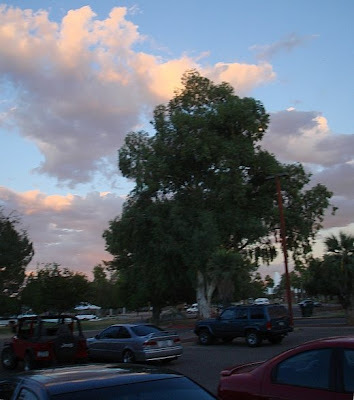 However, the event was sparsely attended, perhaps because this was Homecoming Weekend at the University of Arizona. I kind of doubt that much money was raised for the Obama campaign, but perhaps that wasn't the point. Many of the attendees have spent the past several months (or longer) making phone calls, canvassing neighborhoods, organizing events, printing information flyers, burning pro-Obama DVDs, etc. This concert seems to have been a chance for campaign volunteers to have a little fun, connect with each other, and get fired up for the final push. One of the event organizers spoke about how she had never been involved in a political campaign before, and of all the friends she'd made working to get Barack Obama elected. Other organizers and some of the musicians expressed similar sentiments. There were probably fewer than a hundred people in attendance all told, but they seemed to be enjoying the concert and each other, and the commitment to the cause was palpable. Okay, so he was only a stand-up. Shortly before I left I spoke briefly with the woman who had brought the Barack Obama stand-up people had been posing with all evening. 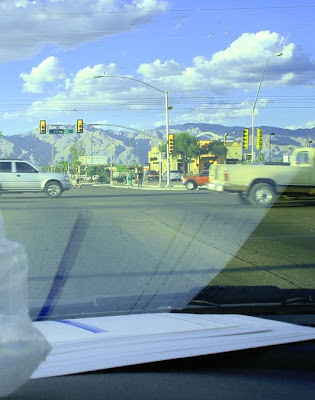 "I had fun setting it up in the passenger seat for the drive over," she said, "but only two people noticed." She had bought it in Flagstaff, of all places. Later she was in a shop in Sedona that carried life-sized stand-ups, including John Wayne. 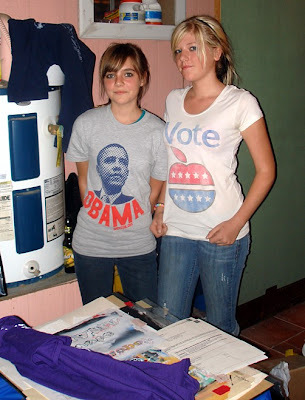 She asked if they carried an Obama one. "What are you talking about?" the shopkeeper replied. "This is McCain country. His ranch is just up the road." 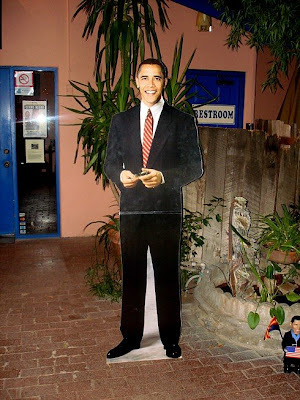 Okay, so Northern Arizona may have a mixed reaction to Barack Obama, even now. That's not surprising. The whole state is probably like that. The few polls that have been conducted here lately show the race getting close. 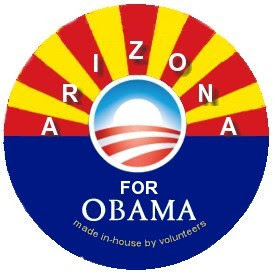 Few people really think Obama can win Arizona, but down here people are starting to dream of the possibility that John McCain won't carry his own state. Even if that doesn't happen, Obama may well carry Pima County, and his coattails should help Democrats statewide. Eight days to go! A volunteer called this afternoon and asked me to make phone calls this week. I didn't promise - the very idea of cold calling strangers fills me with dread - but I'm thinking about it. Tonight I was at the Tucson Artists for Obama Exhibit & Reception. My buttons were the least of the exhibits, with a possible exception of a painted pumpkin. Just about the only indication I had all night that anyone looked at them for more than a second or two was the fact that someone stole the "THIS ONE IS FOR 'THAT ONE'" button. But that's not particularly important. I'm willing to put that down to someone not understanding that they were for display only. The point, such as it is, of this photo essay I'm about to rush through is that I encountered numerous forms of art today. 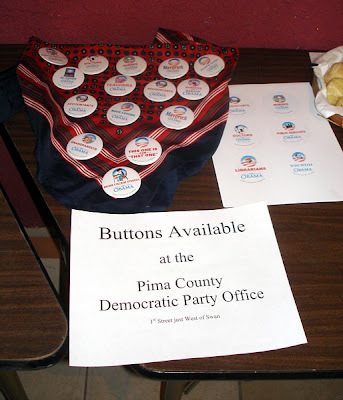 It started at the Pima County Democratic Headquarters, where I photographed some homemade Obama signs. It's actually rather rare to see the official ones around here. They're hard to get, and they get stolen. 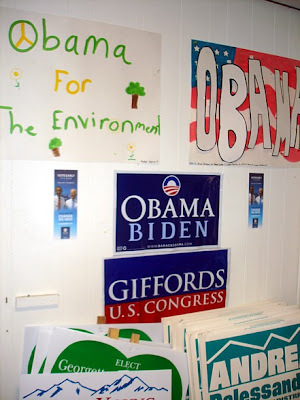 And in case you're wondering, McCain-Palin signs are no more common than Obama ones. I was unable to get a good selection of buttons for the display, and had to settle for dupes as well as some from my personal supply. Barb, the volunteers and I have made at least 3,000 buttons in the last several weeks, about half of them from my designs. Barb is out of parts again, and there probably aren't more than about 50 buttons in stock right now, total. When I left there I headed downtown to Rep. Grijalva's headquarters on Stone Ave. On the way I discovered that it's homecoming weekend. 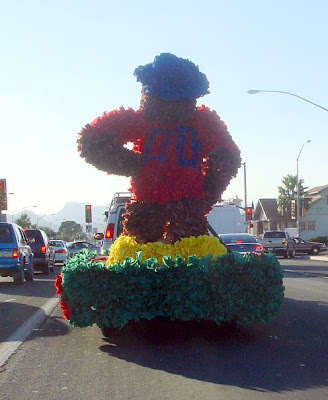 I knew this because I found myself driving behind this float! And how is this for art: a vintage Spanish Colonial(?) 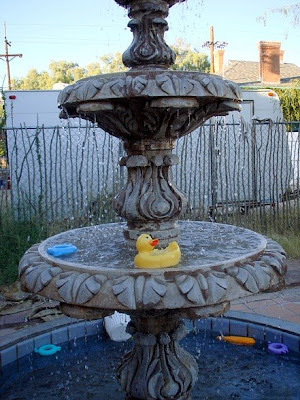 style fountain, whimsically decorated with bath toys. This was in front of Grijalva HQ, a large converted house in the barrio. A few of those pictures made out of smaller pictures. I dropped off the buttons, want home, made the daily dog park run and returned downtown for the art show. Here are three of the exhibits, all up for silent auction. 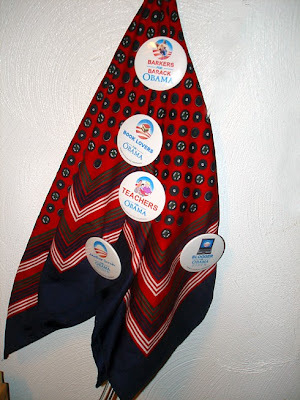 The buttons in the middle are small Obama buttons from Canada, of all places. There were custom T-shirts being made, too, by an artist who donated the paints and stencils and most of the labor. And there was music, by a guitarist-singer who evidently likes the Beatles a lot. This, of vourse, won me over right away! He also played La Bamba, restyled Obama, and even had an original song, You Rock My Boat, Obama. Or was it You Rock My Vote? First off: I didn't get the job I interviewed for on Tuesday. The nice CFO from the company that makes the machine that goes bing was reportedly very impressed with me, but I could not honestly say I'd done monthly close and financials unassisted, so he hired someone who has. Turns out the nice CFO is retiring anyway, so I would not have had him for a boss. The same recruiter is putting me in for a staff accountant position with a medical group. If I can get into the medical industry I should be all set: Tucson has at least 6 major hospitals and I think three doctors' consortiums. I applied to my own doctor's medical group a few weeks ago, but they never responded, darn it. Friday also brought a few developments on the political and creative front. I responded to still more right-wing emails, debunking stuff in my own words backed up with links to web sites. This time I dared my friend to forward my stuff for a change, not just the smears. But I'm reasonably sure she won't do it. When I went to the dog park today, a woman who loudly proclaimed her support of McCain as I walked past in my new Obama shirt on Wednesday again reacted to the shirt. This time she loudly told her Obama-supporting friend, "There's your friend again." "With the shirt," her friend said, without rancor. I was just a little annoyed. She then asked whether a certain dog was mine, and, when I said no, whether I knew to whom the dog belonged. I said I didn't, introduced Cayenne and Pepper, and kept walking. 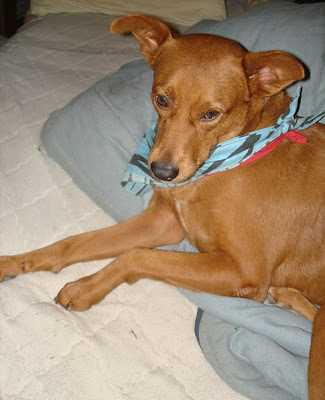 On a later circuit of the park, she said that Cayenne looked cute in her bandannas, which warmed my wary heart just a bit. 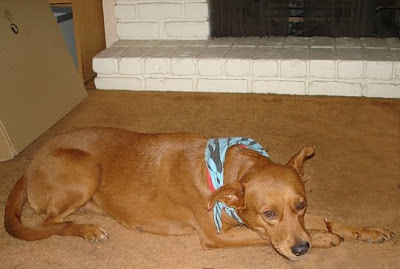 But Cayenne didn't stop to be pattered by her, as she sometimes does for other dog owners. Maybe she knew I was a little uneasy about this particular woman, not so much because she's a McCain supporter as because she was at least marginally rude about it. McCain stickers at Miko's Corner. But I messed up the photo. I have a few new submissions to Huffington Post in the works, not just the second of what will probably be four weekly grassroots reports from the field, but possibly two other pieces. We'll have to see. One, if it happens, will be a few brief snippets as part of a larger piece. The other, pending acceptance, is a photo essay. I see now that at least one of the photos I took for it is no good. Probably I forgot to check the camera's setting again. This week I haven't actually been very good at getting out and doing any campaign stuff, between the job interview and the all-consuming Twitter feed of election news, but I'll be rectifying that this weekend. 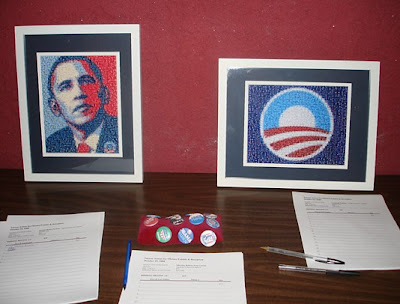 There's a concert for Obama and an art exhibit for Obama. I offered my buttons as an art exhibit, with a caveat that I "didn't draw a thing." The organizer accepted the offer. I'm experimenting with ways to display the buttons. How about on this scarf? Weekend Assignment #239: Imagine that you have the world's full attention (or your country's full attention) for a maximum of two minutes. What do you tell everyone? Your message can be a single sentence if you like, or a bit longer. Extra Credit: Would you prefer your message to be broadcast on tv or radio, or published in multiple print media? Calm down. It's going to be all right. 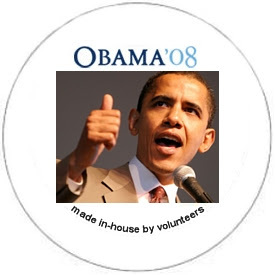 Barring a major disaster, or voting-related shenanigans that dwarf 2000 and 2004 combined, Barack Obama will be elected President of the United States less than two weeks from now. The entire country is on edge, either worried that something bad will happen between now and then, or else that the black guy with the foreign name will use his power as President to do something terrible. 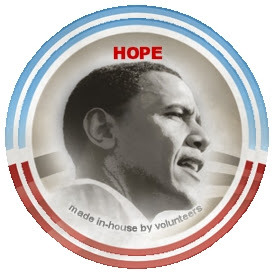 If you're worried that Obama might somehow lose the election, then be sure to confirm that your voter registration remains intact, and help make sure everyone who legitimately registered has an opportunity to vote and have the vote be counted. Aside from that, just keep going, and don't freak out. If you're worried that Obama will win, then consider this. 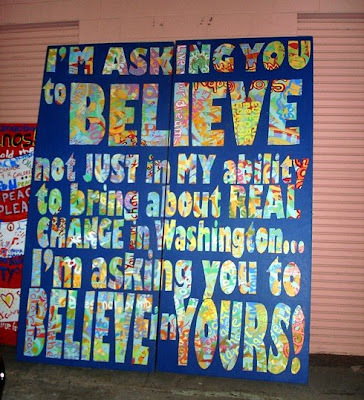 For many months, people have been lying to you, doing their best to fill you with fear of Barack Obama, his policies, or both, so that you will vote for the Republican - any Republican. The truth is, you don't need to be afraid. Barack Obama is not Anti-American, a Muslim (not that a Muslim is automatically a bad person), a terrorist, a Socialist, a Commie or the Antichrist. He is not about to raise your taxes, kill your baby or hand control of the U.S. Government to Osama Bin Laden. So relax. It's going to be all right. Reject the politics of fear, and the potential violence that has already resulted in death threats, assaults on a reporter and an Obama volunteer, and even a kicked dog. Just be cool. Watch and wait. Soon you will see that the guy with the funny name is doing his best to look out for you. How would I deliver this message? I think I'd like to deliver a speech. Just don't let Chris Matthews or Bill O'Reilly interrupt me, okay? But the written word is fine, too. Your turn! Give us your message to the world, and we'll help to spread it. Write it up in your blog along with a link back here, and leave a link to your entry in the comments below. I'll be back in a week with a roundup of your responses. My first job after I got married was with a small ad agency. Long story short, the guy was terribly clueless about how things worked. I kept with it because I didn't have any prospect of another job, and I kept hoping things would look up. They didn't. I never got paid, and every time I asked for money the boss would quote the Old Testament to me. It was a bad situation, and I finally had enough and left after he spent thousands on camera gear, but had no money to pay me. The next morning we went out to the car to leave for church (I did do that regularly for a number of years) and discovered that I must have been so sleepy I had forgotten to lock the car doors - and apparently someone had noticed. 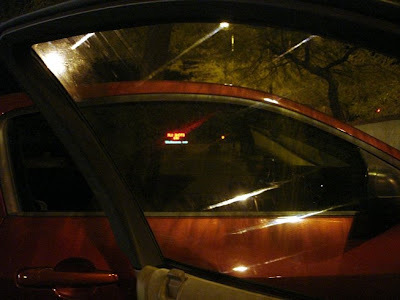 However, while I had made breaking into the car easy for them, they must have gotten frustrated once they actually got inside, since they were unable to dislodge the car stereo. They were successful in stealing the knobs off it, though. I took my Land Speeder and put it behind the air conditioner and said bye to my friends as I went inside. When I came home it was gone. I looked all over the deck, and I probably cried a little, but it was never found. I've always thought that one of my friends I was playing with took it, but I never confronted him. It still haunts me to this day. That's it for tonight. Now it's your turn. The microphone is in your hands, and your favorite media outlets are waiting to hear from you. I know you have something to say. So say it! And don't forget to leave your links! Showing off pre-bath, Cayenne gets tangled in a blanket. As promised, I gave each of the dogs a bath today. Take a look! 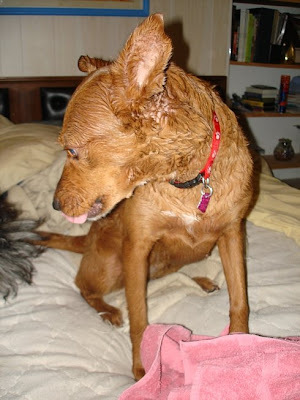 Wet dog on the bed! About 4 PM on Wednesday, I lured Cayenne into the bathroom, shut the door, and listed her into the tub. John had already laid down a plastic mat to protect her from sliding around. Cayenne wasn't thrilled, and shrank back a little, but really she was very good and didn't struggle at all. While I was at it, I threw her bandannas in the washer and got those clean, too. 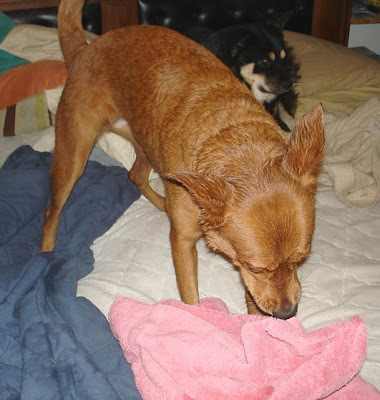 After her bath she ran around like a crazy dog, leaping on and off the bed, running into the front room and back, and shaking herself dry. I found a clean pink towel in the laundry basket and tried to dry her off. 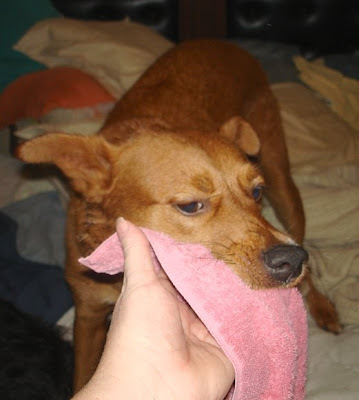 The titanic struggle between Cayenne and a pink towel. Can I dry you off with this, please? Oh, well. 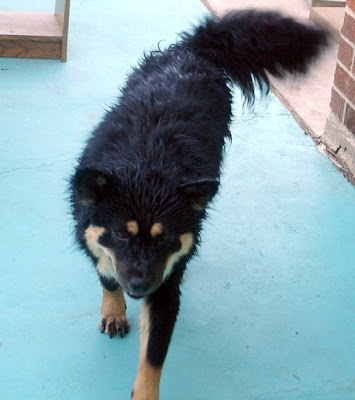 I did dry her off a bit, and she had fun, and the towel didn't mind. I waited a little while and then repeated the process (lather, rince, repeat!) with Pepper. Here she is after her bath. She behaved at least as well in the tub as Cayenne did, sniffed at the shampoo bottles, and let me towel dry her afterward. Wet dog on the floor! The dog park today was relatively stress free. There were no doggie altercations involving the Blocher dogs, although Pepper was way too interested in barking at a very gentle and low-key St. Bernard. I told the woman with the three dogs about Cayenne bleeding after her dog's attack the other night, and she showed genuine concern. She guessed immediately which dog did the damage, and said, rather lamely I thought, that the dog was behaving well today. Maybe, but that's not the point. She wanted to make nice with Cayenne and comfort her (not that Cayenne would understand), but stopped herself before she got close. 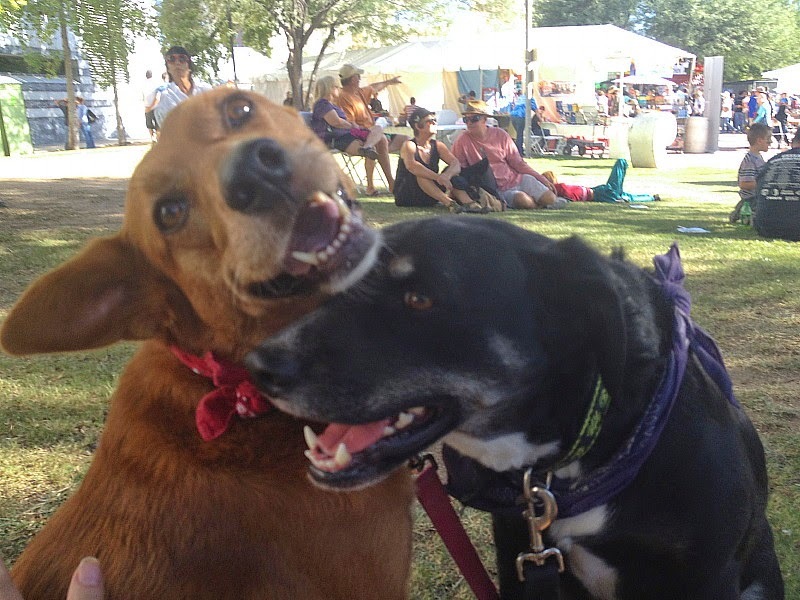 "I can't show affection to other dogs," she explained, because her three get jealous. Woman #1: I should have the word McCain tattooed to my forehead. Woman #2: I was going to wear my Obama shirt today. Woman #1: I should have worn my Palin shirt. Can you imagine? Young Man on Bench (to wife or girlfriend): Don't worry. 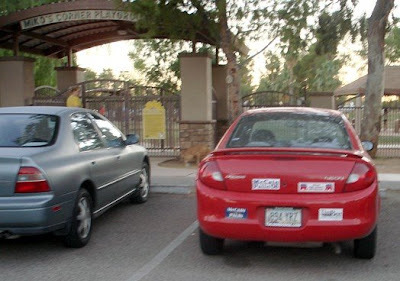 We have two McCain stickers on one car! Such is life in Tucson, 13 days out from the election. In other news, Huffington Post has published a roundup of Off the Bus "Grassroots Correspondent" entries, featuring my button maker photo at the top of the page. As it happens, more than a few of them are from AZ and NM, and most of them are much more interesting than mine. Check them out! 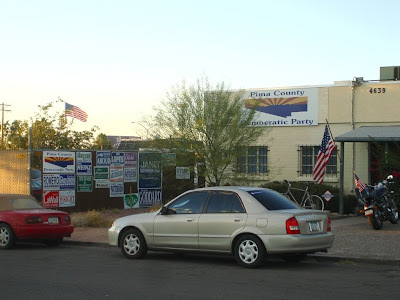 I didn't get to Pima Country Democratic Headquarters today. I did get a real, face to face interview with a prospective employer today. I like the company, the pay and my prospective boss, and the company is not in a distressed industry as my last three non-temp jobs eventually were. I should know by the end of the week whether I got past the other candidates for the job. My toes seem to be much better. Apparently they're not broken after all. The second toe is still red and sore and its nail is broken, but the bones seem to be intact. Two emails arrived today from people I knew over 30 years ago, courtesy of the Huffington Post piece. The first was from one of several people named John that I knew before meeting the one I married. The second was from a good friend from high school, the Star Trek club and late night D&D sessions. I love that supporting the Obama campaign can bring about the unintended benefit of reconnecting old friends. Speaking of HuffPo, another mass email came in from them, soliciting photos for grassroots correspondents' entries. I've reached the conclusion that the article reached the editor as text, with the photos and links stripped out. Kudos to him or her for somehow restoring the one link that mattered most. Anyway, I sent off the photos again, this time as attachments, with a couple more thrown in to give the editor more options. Because of the job interview and some internet distractions, the dogs and I were late getting to the dog park, arriving a little after sunset. Shortly after arrival, I had a brief discussion with other dog owners, during which Cayenne wandered off. (Note this is an enclosed area with double gates, airlock style. 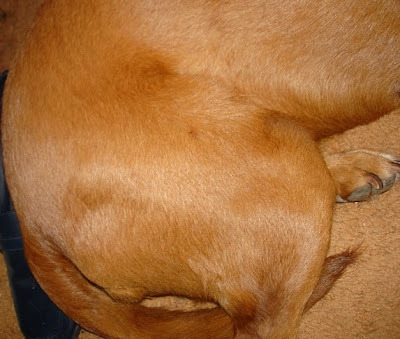 It's almost impossible to lose a dog completely in there, but very easy to lose track of exactly where your particular medium-sized dog is among the others, especially at dusk.) 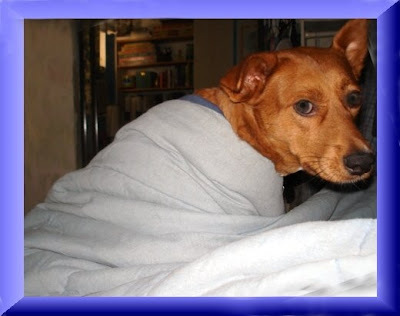 When I noticed she was gone, I called, but did not see her initially, and no dog came running. About a minute later she turned up behind me, almost cringing and definitely hunkered down as she explored the perimeter of the enclosure just inside the fence, and ate a little grass. She did not come to me. I had to go to her. 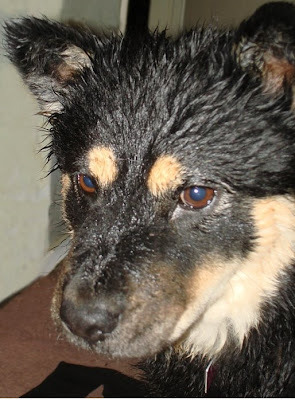 Her coat as wet, which means that a dog was after her. Again. There was no blood this time, but she was definitely showing signs of having been frightened. And Pepper, who had not wandered away, was suddenly much more given to growling and barking tonight. I spoke briefly about Monday's definite attack on Cayenne and Tuesday's possible one with my friend the journalism student, who had just arrived with her dog. Then I took them home. Pepper wasn't thrilled to be leaving within minutes of arriving, but Cayenne didn't seem to mind at all. This evening I put in a call to Cayenne's vet, even though Monday's bites or cuts or scratches weren't at all deep and are already healing. My voicemail was returned within twenty minutes or so. I was told to clean the area with diluted Betadine. So I went off to Walgreen;s.
Outside Walgreens, I attempt kind of a trick shot. I selected a generic instead of Betadine proper, because there was a $6 difference. It's expensive stuff! 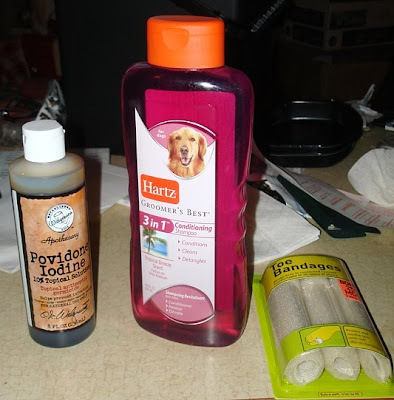 I also got dog shampoo, so I can mix the iodine stuff with shampoo that's definitely safe for dogs. Pepper will be getting a bath now too. She's all matted again since we ran out of doggie essential oils. 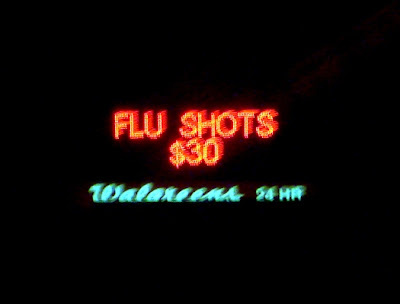 This Walgreen's is one of two today that I saw promoting flu shots. I'd like to get one, but money is tight enogh that I'll just have to take my chances. 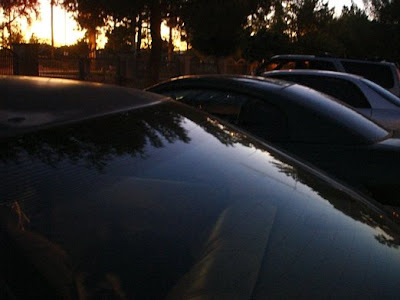 EMPS: Reflections of My Car; Bad Dog! As if by a trick of the light, reflecting the changing colors of a stormy sunset (but it was not sunset), the water shone first with a golden light, and then with the dark silver of carbon steel. 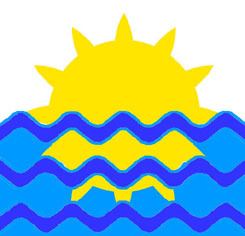 On the pool’s surface an image formed. --from Heirs of Mâvarin, Chapter Two: "The Truth"
For Ellipsis Monday Photo Shoot #8: Reflections, Carly asks to see any sort of reflection. I was on the go late this afternoon in my car, taking the dogs to the Democratic headquarters briefly and then on to the dog park. I decided to try to catch reflections on the car itself. As I took the shots, I couldn't tell whether any of them worked well enough, but now I'm happy to say that most of them did. Printouts (buttons and HuffPo entry on the dashboard. Trees reflected in my windshield at sunset. 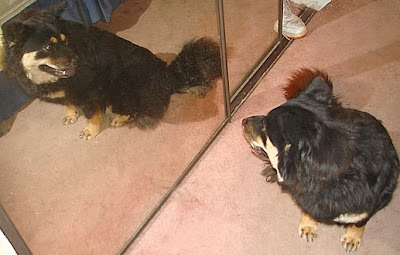 To round things off, here's a more traditional reflection shot: Pepper in the mirror. Be sure to check out Ellipsis every Monday for the week's theme, and a roundup of the previous week's entries. I'm a little behind on making the rouns myself, but hope to rectify that tomorrow. Cayenne has survived her difficult day. It's been one of those good news / bad news days. My Huffington Post piece was published, but with no photos. My newest button designs, thrown together late this afternoon, were a hit, but the campaign can't keep up with the button demand. On the job front, I found out that the job I'm supposed to interview for is in my pay range, and my potential boss is considered a great guy; but I waited all afternoon for an interview to be scheduled. It now looks to be a phone screening tomorrow. 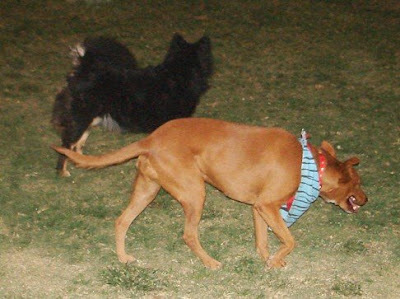 And the dogs got to the dog park - and Cayenne was attacked by another dog. She was bleeding in at least three places when we got home. There is a woman who is there almost every day. I think she has three dogs, but maybe there are only two. One is a German shepherd who intermittently bullies other dogs. I think it was on Saturday that he went after Cayenne before, and was chased away by Cayenne's unexpected defender, Pepper. Hooray, Pepper! The owner was pleased that another dog stood up to hers. But that doesn't help much, does it? It wasn't even the first bullying incident from that dog that day. It's probably inevitable that in a place where lots of dogs interact more or less freely, sudden altercations will arise. 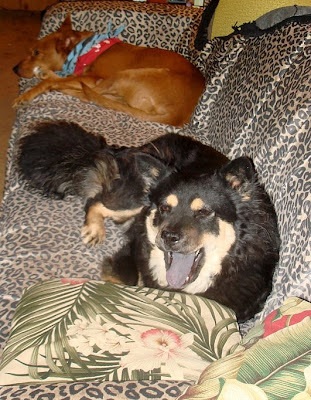 One dog will want to play, and another will take offense or just get too aggressive about it. Usually the owners call off the dogs with no harm done. But today, this woman's dogs ganged up on Cayenne. She ended up on her back, trying to assume the position, defend herself and wriggle away, as the woman's second dog (pit bull? not sure) attacked. I yelled, but the dog didn't stop until the woman pulled him off. She subsequently put the German shepherd on his leash, but not the other dog (I think). Cayenne was covered in cut grass and dog slobber, but I didn't see the bites and the bleeding until I got her home. You probably can't tell from the picture, but the bites are there. They're not serious, but that's not the point. They shouldn't exist at all. Next time I see that woman, I'm going to tell her that letting her dogs attack other dogs, even for a moment, is not acceptable. If she can't keep them from biting other dogs when they're unleashed, then they should not be unleashed. Not in a crowded dog park. One unexpected incident and no harm done is clearly forgivable. But this is getting to be a pattern. Weekend Assignment #238: What a Rip Off! EMPS: Hey! You! Get Off of My Couch! Patterns of Force: Has McCain Lost Control?